We had a very successful day as the sun was shining as we met at the Royal Oak in Hurdlow for coffee. We then set off on a 50 mile drive visiting Earl Sterndale, along Morridge Edge, Butterton, Milldale, Hartington and back to the Royal Oak for Sunday lunch. In total we had 18 people, 7 Tractions, a Skoda and DS3. Sunday 4th February – eleven of us met for a lovely lunch at the Hanging Gate in Shottle – a new pub for us which we will certainly return to. Congratulations to Alistair & Dave for braving the weather in their Tractions – a rare sight in the Derbyshire winter weather. Sunday 3rd December – thirteen of us met up at the Gate Inn in Tansley for lunch and a natter. No Tractions were present – was it too cold OR too much salt on the road?? We had our best attended meeting for ages – 23 people and 8 Tractions. 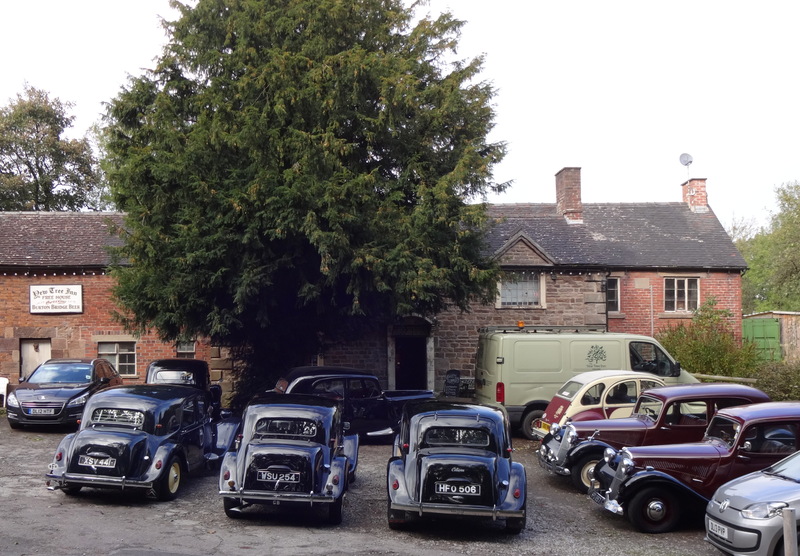 The reason is we all love the Yew Tree Inn as it is so quirky with its treasure trove of fascinating curiosities and antiques, the most impressive pieces being the working polyphons and symphonions. There are also two pairs of Queen Victoria’s stockings, a 3,000-year-old Grecian urn, an amazing collection of ceramics and pottery, a penny-farthing, boneshaker bicycles and the infamous Acme Dog Carrier. Well worth a visit if anyone is travelling in Staffordshire. Even the Yew tree in the photo is over 600 years old! The 2CV belongs to Dan, the landlord, so he is happy to be invaded by our classic Citroens.